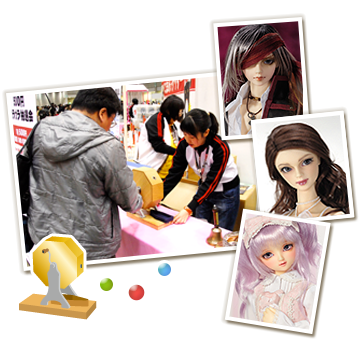 Event Programs Game Area | Dolls Party in LA 4 2019 | VOLKS USA, Inc. The fun part of Dolpa is not only the shopping! Play a game and win special prizes! VOLKS will be presenting various games from Dolpa in Japan! Once you are done shopping, come stop by to play some games to make fun memories for the day! The prizes you will get are all related to Dollfie®, so let’s play to win the items for your Dollfie® and have some fun together! Please follow the event staff’s instructions. Children under 15 years of age are not admitted for this game. The game will end when all the prizes have been won. Please keep in mind that exchanges or returns are not accepted. Limit one try per customer during peak hours. Please return the Komame☆Cap Gun after your turn. An exciting game from Dolpa in Japan is coming to the US again! Win a Komame paper bag full of Dollfie® items! Do you want to know what’s in the Komame Bag? Dollfie® size "Shoes", an "Outfit", a "Wig" and more wonderful goods! Do you think you have what it takes? Please stand from 6 feet (72 in) away. Limit one prize per play (regardless of how many bags knocked down). A consolation prize will be given to those who do not win. Please keep in mind the safety for others and yourself. If you commit an unsafe or unfair act, you will be asked to leave. * This image is a sample. Turn the raffle drum to win a prize! A prize is guaranteed, but there is a chance to win something more special!! Even if all of the special prizes are gone, there is still one last hope for the person who pulls the last ball! These eyes could not be sold with a Dollfie® due to their slight imperfections such as small bubbles or scars. 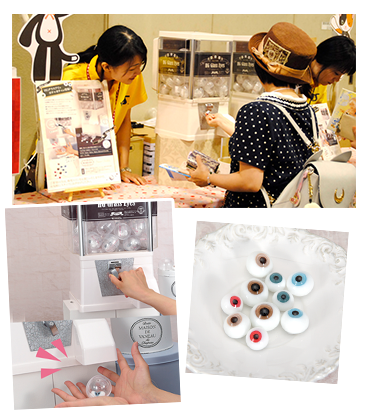 Let’s get a pair of B-Grade HG Glass Eyes from this Gacha box! Size of eyes will come at random (14, 16, 18, or 20 mm). Color of eyes will come at random. There are no size or color descriptions on the package. There may be scars, air bubbles, and a slight difference in size and color. Please return the plastic capsules after you grab the prize inside. The special collaboration of "Gacha x Dollfie Dream®" has come back to Dolpa in LA! Can you get the prize for your DD? 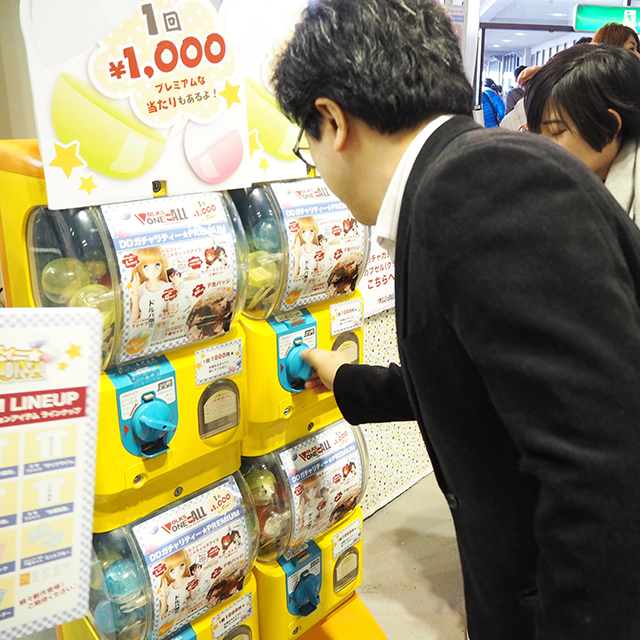 *"Gacha (Gachapon)" is lucky draw system that is very popular within Japan, especially in Akihabara. 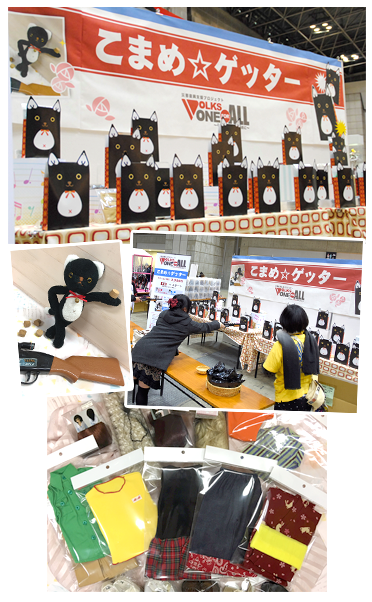 VOLKS has prepared a special limited edition Gacha for this event, where all of the prizes are very rare in Japan! Don’t miss out on this great opportunity to get one! Memo: A prize is in a plastic capsule. Limit four plays per customer during peak hours.